Posted byMT	 December 15, 2011 December 15, 2011 4 Comments on Could everything stop being a metaphor for just five minutes? Exhibit A. Clamshell packaging on cheap electronics. Exhibit B. Filling the humidifier while it’s raining outside. Exhibit C. Traffic on Elston. Exhibit D. A messy house. Exhibit F. The empty laundry basket that’s been sitting in the same spot for a week. Exhibit I. The sky, right at this moment. Exhibit K. That piece of fuzz on the blind. Its weightlessness. Its replicating powers. Its almost-lack of color or form. Its polite insistence. Its network of friends. Exhibit Z. That dream last night. Specifically, the part with the ladder. Exhibit 13-B. 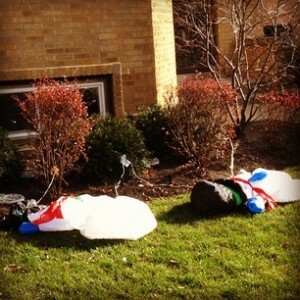 Inflatable snowmen, deflated. I keep seeing those deflated snowmen on the way to the park. They look so sad like that. Which would make it a Meta-metaphor. You’re good at those.